I knew Maria Asumpta, built 1858, and her people well when she was based at Charlestown and I lived at nearby Par Beach, Cornwall. I climbed those masts many a time including a few wild nights. One night in particular I’ll never forget, force 9 off Dungeness going aloft to reef tops’ls… Wow, what a view we had ! She was the last example of a 19 th century merchant brig that still looked, felt and smelt like one. I sailed in her including most memorably to Sheveningham in the Netherlands, a voyage that included thunderstorms and a force 9. Maria Asumpta was at the time the world’s oldest actively sailing square rigger. Built in Spain Maria Asumpta was 11 years older than the Cutty Sark (now permanently conserved at Greenwich, London). 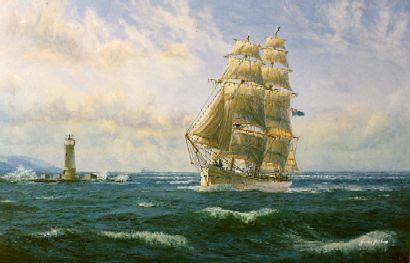 I have been fortunate to know both Maria Asumpta and Cutty Sark, and to have exhibited on-board Cutty Sark and voyaged on Maria Asumpta. To acquire this or commission a similar painting, excellent value, payments may by arrangement be made in easy stages.